Detail King offers complete Turn-Key Auto Detailing Business Start-Up Kits from the Industry Leader! We are not a franchise but support you like one without the fees or royalties. We offer various Auto Detailing Training Programs though the Detail King Auto Detailing Training Institute. We provide lifetime support for anyone that purchases any of our Auto Detailing Business Opportunities so you can continue to grow your business. There is no experience necessary and the income potential is unlimited. Professional auto detailing is considered to be a recession-proof business. When the economy is in good shape, individuals and businesses purchase new vehicles and pay to have them professionally cosmetically maintained. When the economy is in bad shape, people keep their vehicles longer and tend take better care of them. Every vehicle on the road is a potential customer, you just have to determine how to get your message out to the various niches. Detail King has been providing affordable auto detailing business start-up kits since 1999. We have a great selection of start-up kits that are designed to meet everyone’s needs and budget. Whether you are operating your detailing business part-time or full-time we have the auto detailing supplies and equipment package that you need. We have created several profitable auto detailing start-up kits that are priced between $1,794 to $24,583 that will enable just about anyone, from any walks of life to start, operate, and grow their own mobile auto detailing or auto detailing business. Eliminate all the guess work involved with what auto detailing products you will need to start your detailing business with. Let a Detail King team member help determine your needs based on your budget. We will never try to sell you something you will not use. We are committed to help you succeed. If you don’t succeed, than neither will we! Be sure to check out our Auto Detailing Business Plan so you can see what you may need to do to set-up your detailing business properly. Remember every vehicle on the road is a potential customer, we can help you develop a game plan to cultivate new niches to obtain those customers. Most of our Business Packages include our auto detailing advertising and marketing CDs so you can easily create professional auto detailing flyers, service menus, door hangers, and auto detailing forms and checklists. We also include on-going support and free phone and email consultation for as long as you need it. Be sure to check out our New Business Package X which lets you build your own business start-up package, the more detailing products you add the deeper your discount gets! We offer our newest turn-key start-up package standard with a fully wrapped and equipped Mobile Auto Detailing Trailer! Our Business Package VI, our turn-key business opportunity, includes our DK5800 enclosed mobile detailing trailer. With the included mobile detailing trailer you can actually grow your new detailing business quickly because you can take your “detail shop on wheels” to people’s homes and businesses and go just about anywhere you want. If you are on a tight budget but still want to be able to offer profitable full-service auto detailing services be sure to take a look at our Deluxe Weekend Warrior Auto Detailer Start Up Kit. With this kit you actually receive a pressure washer, Mytee heated extractor and Flex Polisher along with many of the core auto detailing chemicals and products needed. Be sure to review our sample auto detailing business plan and check out the auto detailing solutions tab, both of these sections of our web site may help you determine the professional car detailing kit could be right for you. Be sure to check out all of our auto detailing supplies and auto detailing equipment business opportunity packages below. 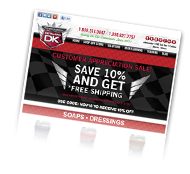 Don’t forget to sign up for our Detailing Business Newsletters and Special Offers & Discounts. Also, become a fan of our Detail King Facebook fan page. Our Detailer’s Business Start Up Package I is all new for 2016 and will enable you to get started quickly. You can start making money a few days after you get your kit. This kit features most of the popular professional auto detailing supplies including; interior and exterior cleaning chemicals, dressings, polishes, glazes, waxes, accessories, the Flex 3401 DA Polisher and free on-going consultation . 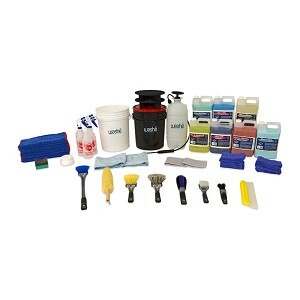 You will receive enough detailing supplies with this kit to clean & detail about 40 average sized vehicles. Let’s say your average car detail price is $150 and you detail 40 cars you would have generated $6000.00. The revenues generated paid for the initial supplies, equipment, training literature and you made a nice profit! Learn more. Our Auto Detailing Business Package Start Up Package II is all new for 2016 and includes everything in Business Package I PLUS the All New Mytee 8070 portable heated extractor. The Mytee 8070 heated extractor is ideal for mobile detailers. You can drastically increase your bottom line by offering Interior carpet and upholstery extractor services for your customers. The Mytee 8070 only weighs 48 pounds and is a breeze to store and move around. The Mytee Lite II comes standard with a 1000 watt in-line heating system that will heat the water to 210 degrees and easily break up grease and ground-in dirt. This carpet extractor has a new powerful 3 stage high performance vacuum motor with 130″ water lift, 120 Psi solution pump, 25′ safety power cord, 3 gallon solution/recovery tanks, and a 4″ wide stainless steel upholstery tool with 15′ vacuum/solution hoses. Learn more. This Auto Detailing Business Start Up Kit is all new for 2016 and Includes everything included in Business Package I and II PLUS a Makita Variable High Speed Buffer including an assortment of 3M Edge buffing and polishing pads. You will get vehicles that need more sever paint correction that only a rotary buffer will be able to fix. If you are procuring wholesale detail work from car dealerships this rotary buffer will come in very handy. Many of the vehicles that car dealerships take on trade have been neglected and the condition of the paint is awful. This start-up kit will enable you to generate more revenues by having the Makita buffer in your arsenal. Learn more. 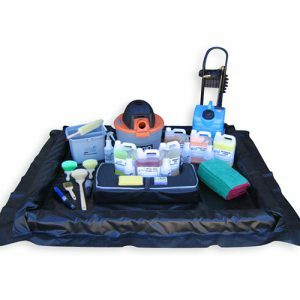 This Car Detailing Start Up Kit comes with everything included in Packages I, II and III PLUS additional auto detailing chemicals, supplies and equipment including an Ozone Generator, Air Mover and we upgrade the heated carpet extractor feature to the Mytee HP 60. Also included in BPIV is the Detail King Authorized Licensee Program with our Platinum Web Site and Mobile App Package. 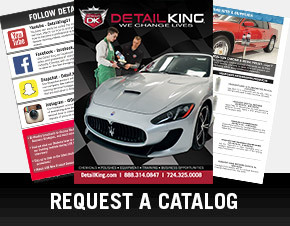 Becoming a Detail King Authorized Licensee will not only earn you a sizable discount on your purchases but will enable you to easily separate yourself from the competition and show your prospects and customer base that you are part of a much bigger picture! Learn more. 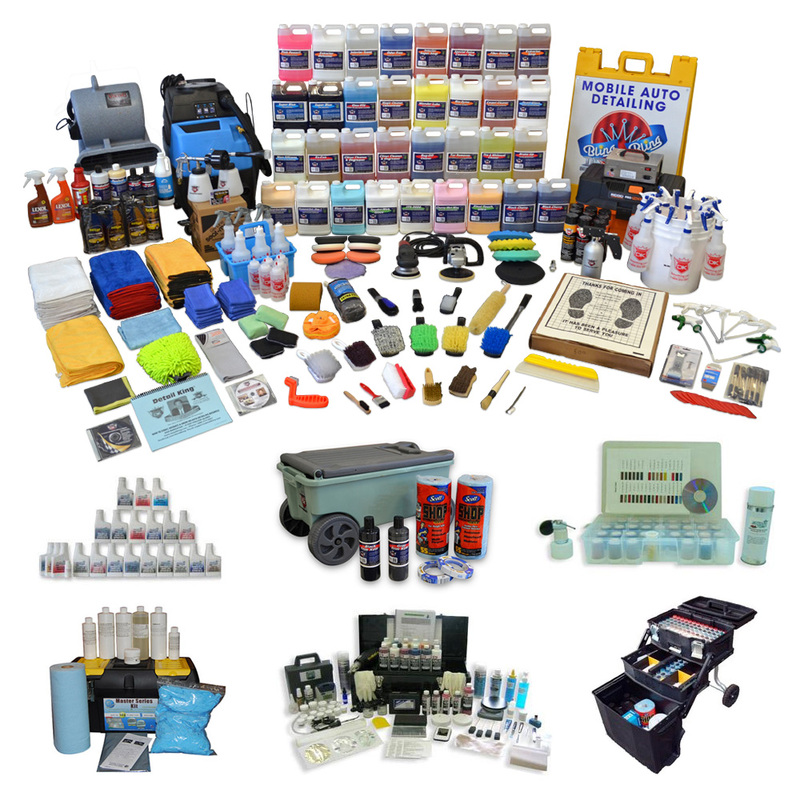 This Auto Detailing and Auto Reconditioning Business Start Up Kit includes everything that is included in Business Packages I, II, III & IV PLUS our added value Profit Centers. The added auto reconditioning profit centers include: Premium Color Twin Paint Chip Repair Kit, Automotive Interior Repair Kit for Vinyl & Leather, Deluxe Cigarette Burn Repair Kit, Commercial Headlight Restoration Kit, Carpet Dye System, and Car Trim Restorer Business Opportunity. Don’t leave money on the table, what car today does not have paint chips or foggy head lights? The Auto Reconditioning Profit Centers will increase your profits on each vehicle and contribute to a successful profitable business. To additionally help you succeed we also include our Auto Detailing Training 3 day Craftsman Seminar. Also keep in mind you become an Authorized Licensee of Detail King when purchasing this start-up kit. Whether you are going to operate a mobile detailing business or work out of a stand-alone location this package will have everything you need. Learn more. This is the most complete Mobile Auto Detailing & Reconditioning Start Up Business Package that we have ever offered – a true Turn-Key Business Opportunity! Business Package VI includes everything in Business Packages I, II, III, IV and V PLUS our custom designed and fully wrapped DK5800 Mobile Detailing Trailer. The DK5800 comes standard with our DK2000 Pressure Washer, 100 Gallon Water Tank, 3500 Watt Generator and a compact but powerful air compressor. This is the perfect set-up for the mobile car detailer and auto reconditioning professional. Included are all of the Auto Reconditioning profit centers in Business Package V, the Authorized Licensee Program and the Auto Detailing Training Seminar and Auto Reconditioning Class. This is a true Turn-Key Business Opportunity that includes a custom web site, mobile app, text alert service, logo development and 5000 custom designed business cards. Learn more. If you are planning on purchasing Business Package II or III and will have a small detail shop or a growing and aggressive mobile detail business you may want to consider upgrading to a larger extractor. You can upgrade from the Mytee 8070 to a Mytee HP 60 or HP 100 and all you pay is the difference in price. The HP 60 & HP 100 Mytee units feature larger solution and recovery tanks. Auto detailing business packages 5 and 6 feature everything you need to offer complete and profitable auto detailing and auto reconditioning services. Provide commercial car interior cleaning services to fleet accounts and include odor removal. We have the right detailing business package so you can acquire profitable niches. Your competition may not offer eco friendly detailing services which makes the opportunity even more lucrative for you to be green!